A batch of 1,700 Silver Generation (SG) Ambassadors are ready and raring to go after completing their training. 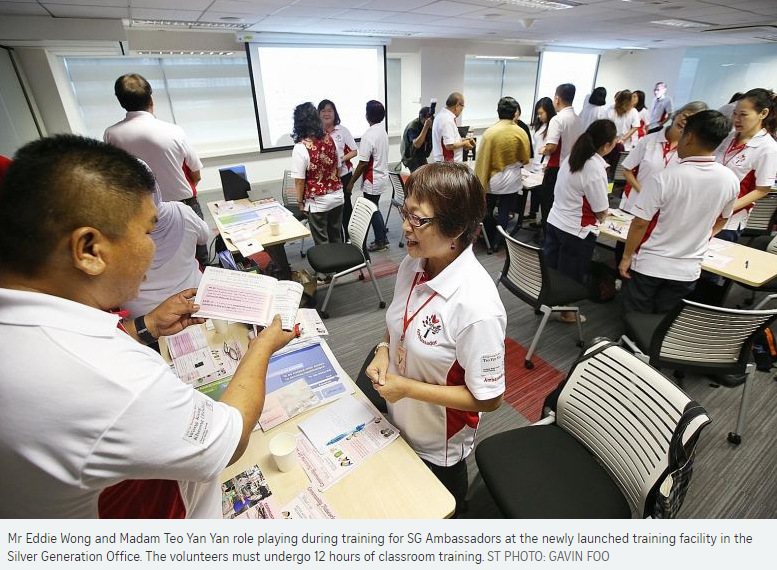 The SG Ambassadors, who are volunteers, have to undergo 12 hours of classroom training at a new training facility at the Silver Generation Office. The facility, which was officially launched by Health Minister Gan Kim Yong last Friday, is located at the Ministry of National Development building in Maxwell Road. It aims to educate volunteers about healthcare services and active ageing schemes available. During their house visits, SG Ambassadors can help to point elderly residents to the relevant support schemes depending on their needs. Four in 10 SG Ambassadors are themselves above the age of 60. Younger volunteers include a married couple, Mr Royce Chan and Ms Jasmine Wong, both 29, who will commence their house visits soon. Based on interaction with his own parents, Mr Chan feels there is a gap between the policies available and awareness among the people these seek to benefit. "There are policies out there, but it might be quite hard for (seniors) to understand," said Mr Chan, an associate at a bank. He cited as an example the Community Health Assist Scheme card, which some seniors may not know about or know how to apply for. Ms Wong, who works in the tourism industry, added: "I think apart from sharing the policies with them, it's also about the befriending - just being there for them if they need a listening ear." Volunteers typically engage with the elderly in their own neighbourhood. Volunteering hours are kept flexible for working professionals like Mr Chan and Ms Wong. Mr Eddie Wong Kang Kheong, 48, works in the logistics industry, and spends his free time volunteering in Keat Hong, where he has lived for almost 20 years. An SG Ambassador since 2015, he said his 15 years of experience in the grassroots committee helped familiarise him with residents. He recalled an elderly resident, whom he clicked with instantly because they speak Hakka. This also allowed the 83-year-old to confide in him about family matters. One day, he received a call from the old man, who had fallen in the bathroom. Mr Wong, who took him to the hospital and visited him during his stay there, said he was happy the elderly resident trusted him and treated him like a close friend. It is never too early to start doing community service. During their university days, Mr Chan was involved in youth expedition projects, while Ms Wong was a volunteer in a programme to help lower-income children. "The first few years after you graduate are usually spent chasing a career," said Mr Chan. "This (volunteering) is one way you can make your life fuller." 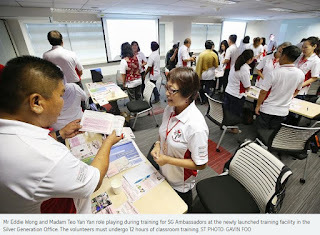 Agreeing, Ms Wong added: "It's very easy to find excuses not to volunteer... But (volunteering) is also a way for us to thank the pioneer generation for making Singapore what it is today."